I love to travel. I find airplanes a little boring sometimes, especially when I'm travelling alone but airports are awesome! You get to see a little part of a country even if it's just a layover. I love watching the people and checking out the stores, food places, magazines etc. It feels a bit like an adventure to me. I seem silly, I know. Hadley's on her way to attend her father's wedding in London but she's 4 minutes late, thereby missing her flight. She's put on the next plane to London when she runs into this really cute boy named Oliver who's also on the same flight. There's instant chemistry. The book takes place over a period of 24 hours - 24 hours which makes Hadley's world go round. The Statistical Probability of Love at First Sight was um, cute. Okay, really it wasn't bad but just wasn't what I expected. You've seen the trailer, you've seen the blurb, you can't blame me for having high hopes for this one! I absolutely loved the parts with Oliver and Hadley, I got butterflies in my stomach when they were on the plane but sadly, they were off the plane 35% into the book. I guess I expected a sweet love story but The Statistical Probability of Love at First Sight didn't just revolve around the two of them. It went deeper than that and I guess that's good YA but I found the trailer and blurb misleading. I expected this taking place at an airport/on a flight. Other than that, I really liked the rest of it. The story starts in a way that's genuine. Hadley and Oliver's initial meeting was realistic, extremely cute and had me wishing it would happen to me! Their interactions take place in an honest way, like how it might happen to one of us at an airport. Oh and seriously, Oliver had me feeling all warm and gooey inside. I know that I would've absolutely loved this book if it had focused more on Hadley and Oliver together, rather than apart. There's a part in the book when both of them get off the flight and are at customs when they were about to get separated - it was AWESOME. I'm getting goosebumps just thinking about it again. That should've been the ending! 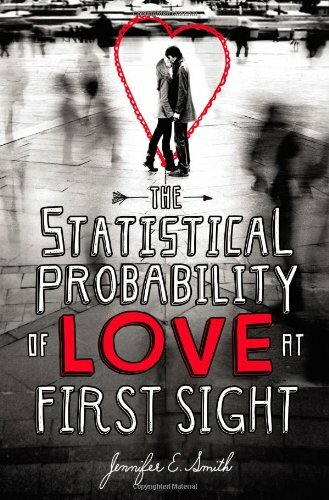 Although the book didn't live up to its hype for me, The Statistical Probability of Love at First sight is still an enjoyable young adult romance and worth checking out. This book sounds very good. Thanks for the share! Well, I am picking up a copy from my Library that I have had on hold for a month or so, and I have been excited about it since it was first mentioned. I like your review, the reviews that I have read are usually right on with how I feel about a book, but I really hope that this one is better for me than it was for you! :) I hate being let down by a book that I have had such high expectations for. I enjoyed your review, as usual! I have been looking forward to this book. But now I am hesitant with your review. Thanks for sharing. I also had never seen the trailer before thanks for sharing that too! I agree! The trailer was misleading, but I liked how everything really did change because of those 4 minutes. I loved this book! I agree with you their meeting was so realistic I truly believed it could happen even to me! Sometinmes the storyline bored me, but in general it was a great book!